When work gets stressful or life in general does, a lot of people crave comfort food. 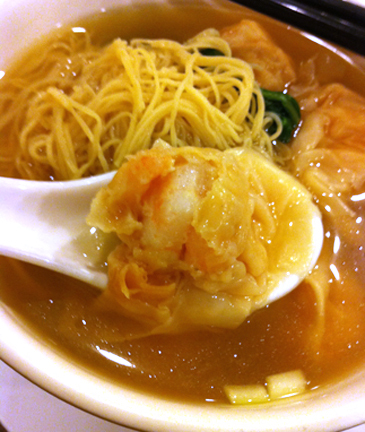 I’m no different and as you may not be surprised, Wonton Mein is my favourite comfort food as well as my favourite type of noodle in soup dish. Unfortunately my preferred 3 eateries to get a great bowl of Wonton Mein are in Richmond, the epicentre of all great Chinese food regardless of genre. However when you live in another suburb of Vancouver and have a bad day, trekking it out to Richmond is just too far. The solution for me is Congee Noodle House. After a very distressing and long week at work, I convinced some friends to come with me to Main & Broadway for some noodles. The place was busy with the majority of the large family and smaller tables occupied. 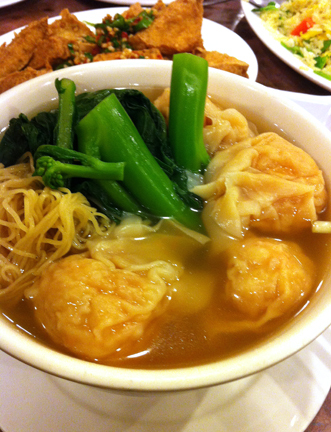 Once seated, I ordered my comforting bowl of noodles with gai lan. Another sign the place was busy, most of our non-noodle and deep fried dishes arrived well ahead of all our noodle soup bowls. When our noodles finally arrived, I was almost too full from eating deep fried tofu with salt and chilies and fried rice. The wontons were filled with shrimp that were not mushy but had a bit of bite to them. The wonton filling was well seasoned. The soup broth I thought was on the blander side but was still flavourful and exhibited a complex seafood taste. How did I feel after two hours? Pretty good and just a touch thirsty so Congee Noodle House either doesn’t use MSG or just a bit to amplify the soup’s taste. GOLD STAR. Now you may be wondering if Congee Noodle House is my go to place for Wontons in Vancouver then why is it not in my preferred 3 destinations? It’s the noodles. From my observation, the consistency of their noodles varies on how busy the restaurant is. When it is moderately to not busy I get al dente noodles. However, I find on busy nights, like this occasion, I often get noodles that a little too soft for my liking. My personal theory is on evenings when they are slammed; the noodle bowls sit at the pass (the area where kitchen staff sends out the food) for too long before the servers pick them up. As the bowls sit, the noodles slowly cook in the hot soup. In previous occasions, I’ve watched as bowls sat at the pass for 2-3 minutes before the busy servers could serve them. I have a feeling this is what happen on this night, as my noodles were a little a soft. They were not mushy but just didn’t have the slight resistance I like my mein to have. 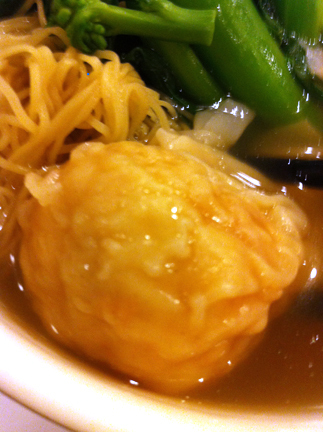 Even with the noodles being past al dente, I still like the Wonton Mein at Congee Noodle House. I find this bowl to be an acceptable alternative to heading out to Richmond, especially if you having a bad day.